Jurgen Habermas is one of the most important German philosophers and social theorists of the late twentieth and early twenty-first century. His work has been compared in scope with Max Weber's, and in philosophical breadth to that of Kant and Hegel. 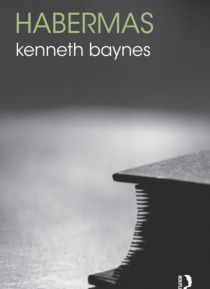 In this much-needed introduction Kenneth Baynes engages with the full range of Habermas's philosophical work, addressing his early arguments concernin… g the emergence of the public sphere and his initial attempt to reconstruct a critical theory of society in Knowledge and Human Interests. He then examines one of Habermas's most influential works, The Theory of Communicative Action, including his controversial account of the rational interpretation of social action. Also covered is Habermas's work on discourse ethics, political and legal theory, including his views on the relation between democracy and constitutionalism, and his arguments concerning human rights and cosmopolitanism. The final chapter assesses Habermas's role as a polemical and prominent public intellectual and his criticism of postmodernism in The Philosophical Discourse of Modernity, in addition to his more recent writings on the relationship between religion and democracy.Habermas is an invaluable guide to this key figure in contemporary philosophy, and suitable for anyone coming to his work for the first time.